There is a sintered candle filter. SCF-1 Due to its high strength, sintered candle filter is very strong and durable.Five sintered candle filters of different types on a white background. 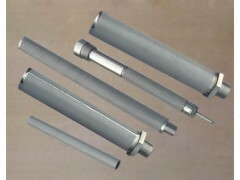 Six long sintered candle filters on the ground. SCF-3 Sintered candle filters are characterized by strong corrosion resistance and high filtration accuracy.There are many short sintered candle filters in the carton.